Cause and the authentic teachings of theosophy. as he identified falsehood, he chose truthfulness. version of the text was revised by the author in 2010. To Richard Robb Tepoztlán, 12 March, 1999. I am a Mexican, and about twenty years ago, I met an Australian born Hungarian girl. We soon got married and later on, in less than one year, we went to live in Australia, where we stayed for eight years. She is an artist painter, and I am an Architect. When I met her in Mexico City, she was about to publish a book in Spanish on yoga and meditation. She introduced to me for the first time, the concepts of reincarnation, karma and then Madame Blavatsky. Soon after our arrival in Australia, and through the yellow pages we found the address of the Theosophical Society and began to attend its lectures every week. Later we joined the Society. At that time, we didn’t know the existence of any other Theosophical Organization nor did we understand the difference between Theosophy and pseudo-theosophy. My wife, Maritza, had already the “Secret Doctrine” and “Isis” in Spanish; we thought that Blavatsky and the Theosophical Society [Adyar] was one and the same thing. During those days we began to buy most of H.P.B.’s original works in English, including the Collected Writings, but unfortunately we also bought many books belonging to the so called “second generation theosophy.” At that time we discovered your magnificent “Secret Doctrine Reference Series” of which we bought about twenty books. After three or four years, we were invited to belong to the Esoteric Section of the T.S. (1986). In 1988, the year of the Australian Bicentenary, we had the opportunity to stay at the Manor, in Mosman, Sydney; the headquarters of the E.S. in Australia. In 1989, we went back to Mexico. As you know, the Manor was the main residence of the infamous Leadbeater. His memory roams about the place and is still alive in every corner of the house. On almost every wall hangs a portrait of him, together with those of his “initiated” pupils like Annie Besant, Jinarajadasa, Arundale, etc. One day, I was reading the Biobibliography of G.R.S. Mead in the Blavatsky Collected Writings, Vol. XIII; I was puzzled by certain words written by Boris de Zirkoff concerning C.W. Leadbeater’s oblique practices, and later at the Manor’s Library - which is at the top floor, overlooking a magnificent view of Sydney’s Harbour - I found out the confirmation of the statement made in several books like: “The Theosophical Movement: 1875-1925”, “The Theosophical Movement: 1875-1950”, “The Elder Brother”, etc. During the next months of our sojourn at the Manor, Maritza and I launched ourselves in an in depth research, using almost all our free time commenting daily on the fruits of our inquiry. In the end, we were both happy and sad. Happy because we were able to get rid of so much accumulated garbage that we had picked up since we joined the T.S. ; and sad, because nobody at the Manor was willing to listen to our findings. Although the Manor is referred by the members as the “Occult Center for the Southern Hemisphere”, most of the classes are based on the most anthropomorphic conceptions written by Annie Besant and C.W. Leadbeater. It is something similar to a brain washing. They try to convince you, for instance, that Mahatma Gandhi was evil, and that it is good to kill in certain occasions. They talk about occult geopolitics, etc. 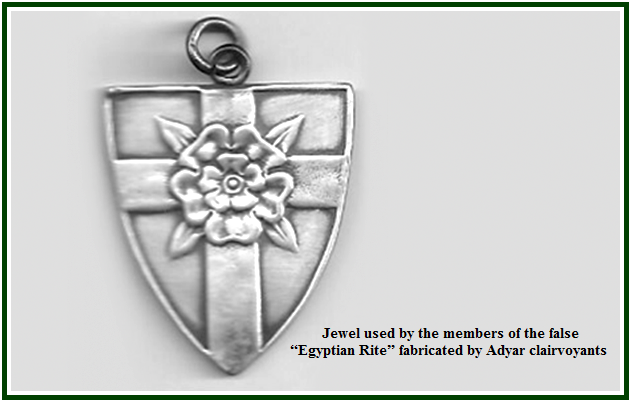 There is a so called Egyptian Rite invented by C.W. Leadbeater and Wedgwood. It is like a masquerade or carnival where people of the E.S. will disguise themselves like Egyptians to perform a promiscuous rite, that is half Masonic and half Roman Catholic Mass. It is a secret organization within the Esoteric Section. Originally this rite had two degrees: the blue and the red, but now there is only one left. The celebration of the E.R. takes place in a large room in the ground floor of the Manor, called “The Temple”. The ceremony is presided by the head of the Manor. The rite is considered by the members to be: “very powerful”. The climax of the celebration is when the chalice is hold by the priestess and the brethren take communion from the chalice and the host. After that all brethren present, raise their arms - as one can see in the Egyptian vignettes - and “send forces to the world”. As we were very disappointed with the Adyar Society, on our way back to Mexico City, at the L.A. airport, I made a phone call to the United Lodge of Theosophists, inquiring if they had any lodge in Mexico City. They gave me two names and an address. In May 1991, one afternoon, we were driving through a certain street in Mexico City, when I told Martiza: “Look, that house is the Theosophical Society Adyar in Mexico.” The address was given to me in Sydney. So, without thinking one second, Maritza told me: “Stop the car, let us see what they are doing.” As we entered into the place, we were lucky to be received by the General Secretary himself. He is the one who sent to you the first issues of Atma Vidya. At that moment he was engaged in preparing an International Congress on Theosophy, to take place in a luxury hotel in Mexico City. After a very animated conversation, and knowing that Maritza is Australian, he immediately invited her to give a lecture, putting her name in the program. She gave her lecture in English. As the smog in Mexico City was becoming thicker at every day, we decided to migrate south. We bought a plot of land in a village called Tepoztlan, which is located forty minutes south of Mexico City and thirty minutes east of Cuernavaca. The village is surrounded by beautiful mountains and with a pyramid on top. The T.S. General Secretary, Carlos Lopez Cerdan, had a house in Cuernavaca, so we met frequently. I was able to give him a manuscript that I had written at the time, showing the difference between real Theosophy and the altered one. This had a positive impact on him, and very soon he asked me to start a “Secret Doctrine” course at the headquarters in Mexico City and Cuernavaca. On one occasion, he showed me the first issue of a “Vidya” Magazine which he was preparing. He asked my opinion. I felt that all his efforts were useless, as most of his articles were written by second generation Theosophists. He then asked me to be the editor. The first thing needed to do was to change the title of the magazine from Vidya to Atma Vidya, and then to change the contents, presenting articles on Original Theosophy. After that, we had many meetings in his house and ours. I designed the cover, and Maritza chose its colours and a photo of H.P.B. I was supposed to translate only a couple of articles, and the rest will be done by other people; but when we received the translations I saw that they were faulty, so I had to do the job myself. All of a sudden I was engaged in a work that I never dreamt of doing before. By the time we reached the fourth issue, Carlos was finishing his term as General Secretary and the T.S. was unable to pay the expenses involved in printing the magazine. By this time we were in contact with Geoffrey Farthing from London and his Blavatsky Trust. Thus, to be able to print Atma Vidya - being inspired by Geoffrey Farthing - we formed the “Fundación Blavatsky” (The Blavatsky Foundation), an indapendent Theosophical organization. Initially, this association consisted of most of the people in the “Secret Doctrine” classes, both from Cuernavaca and Mexico City. Each person gave some amount of money so that we were able to print issues five and six. Currently, we are preparing issue seven. Meanwhile, Geoffrey Farthing asked me to translate his “Deity Cosmos and Man” which I think is a very good introduction to Theosophy. Since our return to Mexico, we soon realized that there were very few works in Spanish about real Theosophy, whereas practically all the works of pseudo-theosophy are available in translations from Spain, Argentina, Mexico, etc.. The few original works that were translated were faulty, for example, “Isis Unveiled” was practically reinvented by the translator. When you compare (page by page) the English and Spanish versions, they are totally two different books. The “Secret Doctrine” has a better translation but it is based on the revised edition of Annie Besant and arranged in six volumes which includes the so called third volume of the “Secret Doctrine”. Perhaps the statement of the U.L.T. to the effect that the third and revised (??) Edition of the “Secret Doctrine” has more than 40,000 changes and alterations could be a bit exaggerated, but I think it is not far away from the truth. Even the Stanzas have been tampered with. (....) As you can see, we have a huge task before us.